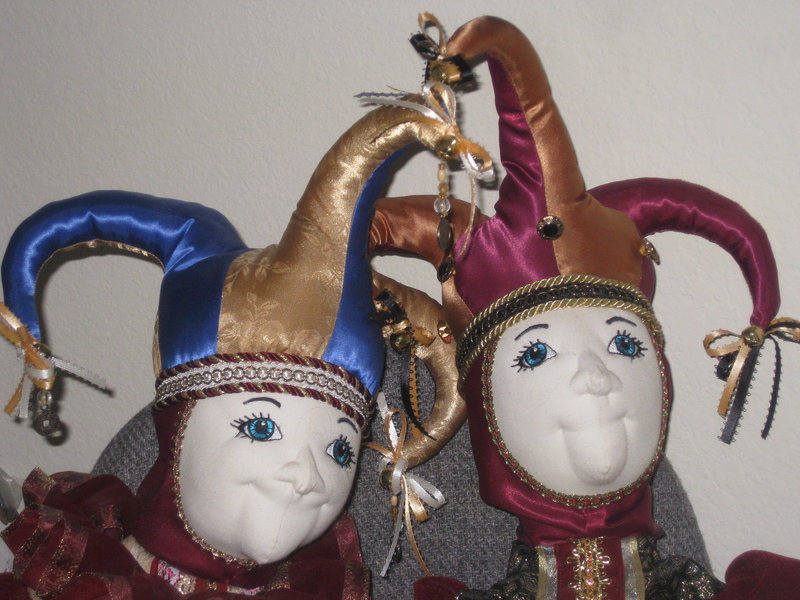 My soft-sculpture Jesters are 3 feet tall and entirely handmade using luxurious fabrics and trims. They are not made to be children’s toys. These are decorative accessories designed to bring a touch of whimsy into any decor. The dolls can be created on a ‘custom’ basis, as a commissioned piece of art, to incorporate or compliment fabrics that are being used in an interior design. I have several that are for sale. The dolls I have for sale are all unique. Each face is soft-sculpted differently, so each has a ‘personality. They are for sale forÂ $495. They are similar in that they are Jesters, but NO two are identical in color scheme, fabric pairingsÂ or trim choices. Each is a one-of-a-kind piece of soft-sculpture art andÂ is numbered and signed. Once you find one that you want, contact meÂ for pay methods. â€¢ To see available dolls, pleaseÂ Â click onÂ CATEGORIES, then click onÂ JESTER DOLLS. Photos are for identification purposes. To see the dolls and all the intricate details contact me for an appointment. 1. A conversation in person, phone, or via email. Pictures provided to me of the interior the Jester will be displayed in, or an idea of the color scheme. Photos are useful to meÂ when I amÂ selecting and coordinating theÂ perfect fabrics and trims to be used in theÂ construction of the soft-sculpture. Some dolls are gifted, so the location they will be displayed in isn’t always known, but an idea of colors that the recipient favors is then discussed so appropriate color pairings can be made. * Pricing is determined by 2 things: A. What materials will be needed, costs of particular fabrics and trims, etc. B. How quickly you need your doll completed. 3. A 50% deposit willÂ be requiredÂ to begin work. 4. Fabric swatches will be submitted in person (if in Las Vegas), through the postal service, or via email, for approval and sign-off. If fabrics are to beÂ incorporated that are also used in the interior design where the Jester will be displayed, then a determined amount of that fabric will be provided to me by the client, or interior designer. 5. Individual pieces are carefully constructed.Â When completed and balance due is paid, your purchase willÂ be delivered or shipped to you. Please allow 3 weeks for fabrication and delivery after deposit is received and fabrics have been approved.